This method is very seldom used because of the rare and irregular flowering of most bamboos observed locally which produced infertile seeds or seldom develop seeds. Moreover, most bamboos generally die soon or a year after flowering. If seeds are available, this is the best method of bamboo propagation since clump age would be known at the initial stage of its life cycle. So far, seven (7) bamboo species have been observed that developed seeds, namely (1) Buho (Schizos-tachyum lumampao), (2) Buhong dilaw (S. brachycladum), (3) Bolo (Gigantochloa levis), (4) Giant bamboo (Dendro-calamus asper), (5) Machiku [Dendrocalamus latiflorus), (6) Dinochloa species and (7) Bonkawe (Cyrtochloa toppingii). 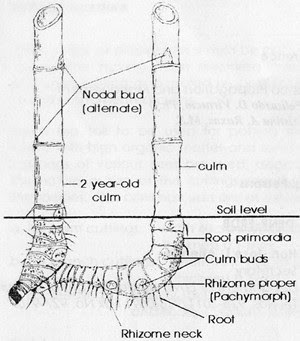 This method makes use of the rhizome and the lower part (basal portion) of a single culm (preferable one to two years old) cut to contain 3 to 5 nodes. The culm is cut on a slanting direction while the rhizome with well-developed buds is severed at the rhizome neck from the parent clump. The offsets should be extracted from a healthy mother clump. Care should be observed in the offset extraction such that the rhizome and the attached roots are not damaged. Once the offset has been extracted, the rhizome portion should be wrapped in banana leaves or wet sack to prevent drying up. The slant cut of the culm should be sealed with earth or mud. The cuttings should be obtained from a culm of about 1.5 to 2 years old. The open internode (the next upper internode) should be kept long as possible by cutting the next upper internode close to the third node portion of the culm. As much as possible, the basal portion of branches should remain at the nodes pruned to about 10 to 30 cm. The existing buds should be healthy and not injured. Once the cutting has been prepared, wax should be applied at both ends or wrap the segments with moist saw-dust or coconut husk to minimize water loss from cut ends. Select 1.5 to 2 year culms from a healthy clump. Prepare one-node cuttings from the selected culm which preferably contain newly developed small living branches attached to the nodes. Then the one-node cuttings are cut into halves to reduce the size of poly-bag in propagation. The branches attached to the node should be pruned to contain 2-3 branch nodes or about a length of 10- 30 cm. In branch pruning, care should be observed not to injure existing buds. The one-node split culm cuttings should be potted or placed as quickly as possible to the propagation bed. Two to three-year old culms are selected from healthy parent clumps, the branches are trimmed and the whole/unsegmented culms are buried and raised in nur-sery beds. The nursery beds are irrigated regularly. This method involves the pre-rooting of unsegmented culms and segmenting of rooted nodes. The rooted nodes are then cut out of the unsegmented culms and transferred to polybags. This method has the advantage of involving less labor and the rooted nodes require smaller polybags which makes it cheaper and easier to handle in transplanting. The cuttings or propagules should be potted immediately after having them prepared through culm or branch cutting or in rooted propagules from pre rooted unsegmented culms. After planting, especially during the first month, if bamboos show signs of wilting, watering should be done. This is normally the case after one week without rain. Three months after planting, the bamboo plants should receive 300 grams of chemical fertilizer containing equal amounts of Nitrogen, Phosphorus and Potassium, or in varying proportions according to the existing soil fertility. During the subsequent three months, the same fertilization should be repeated. The fertilizer should be dug into the soil and after watering the surface should be covered with mulch to prevent nitrogen loss caused by sunlight. The fertilizer and mulch application can be combined with the weeding operation. The plant should be protected against animals, insects, fire, rodents and termites. también Vents at the Port of Valencia.